Svalbard is a group of islands that belongs to Norway located between the Arctic Ocean, Barents Sea, Greenland Sea, and the Norwegian Sea. The islands are directly North of (and since 1920 an integrated part of) Norway. All settlements in Svalbard are located on the main island of Spitsbergen (or Vest-Spitsbergen). 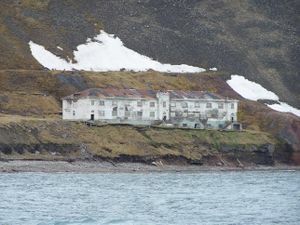 Hornsund — Polish research station, population 10 in winter, around 20-30 in summer. 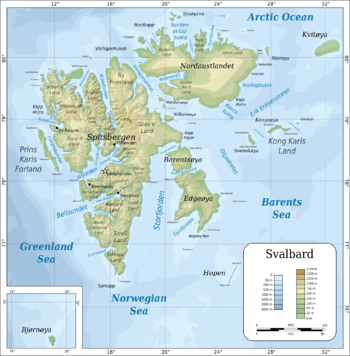 The other islands of Svalbard are uninhabited and, as they are all nature reserves, generally inaccessible without special permission. 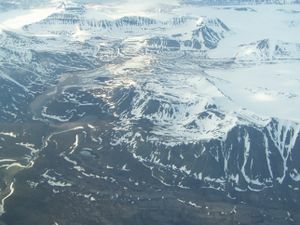 The islands can be divided into two groups: the Spitsbergen group of Barentsøya, Edgeøya, Nordaustlandet and Prins Karls Forland, and the more remote islands of Bjørnøya, Hopen, Kong Karls Land and Kvitøya. Svalbard is the northernmost tip of Europe and, a few research bases aside, its settlements are the northernmost permanently inhabited spots on the planet. Located between the 76° and 81° parallels, they are far more northerly than any part of Alaska and all but a few of Canada's Arctic islands. In fact, they would be permanently locked in by ice if not for the moderating influence of the Gulf Stream, and it is this comparative warmth that makes them habitable. The islands cover a total of 62,050km2, the largest of which are Spitsbergen, Nordaustlandet and Edgeøya. The combined permanent population is less than 3000, nearly all of which is concentrated in the main settlements of Longyearbyen and Barentsburg on Spitsbergen. The islands are governed by Sysselmann på Svalbard, literally if slightly awkwardly translated into English as the Governor of Svalbard; this is not a single person, but the administrative team responsible for police, fire, rescue, and other public services on the islands. The islands were allegedly first discovered by Viking explorers in the 12th century. However the first recorded voyage here was by the Dutch in 1596, landing on the northwest of Spitsbergen. This coast served as an international whaling base during the 17th and 18th centuries. Norway's sovereignty was recognized in 1905; five years later it officially took over the territory. However, the Svalbard Treaty gives "absolute equality" to other nations wishing to exploit mineral deposits, and Russia continues to maintain a significant population on the island. Although part of Norway, Svalbard remains a neutral territory. There is a currently standing treaty that any sign of human presence from before 1946 must remain untouched, including loose objects. For this reason, the area around Longyearbyen is littered with interesting artifacts including disused mining equipment, bits of rope and shovels, etc. Coal mining is the major economic activity on Svalbard. The treaty of 9 February 1920 gives the 41 signatories equal rights to exploit mineral deposits, subject to Norwegian regulation. Although US, UK, Dutch, and Swedish coal companies have mined in the past, the only companies still mining are Norwegian and Russian. The settlements on Svalbard are essentially company towns. The Norwegian state-owned coal company employs nearly 60% of the Norwegian population on the island, runs many of the local services, and provides most of the local infrastructure. There is also some trapping of seal, fox, and walrus. Tourism has also become increasingly important and now powers the economy of the main settlement Longyearbyen, changing it significantly. Nonetheless, the place is not exactly swarming with tourists. Svalbard is barren, rugged and desolate. Its mountains look like giant, precipitous slag heaps: steeply piled stacks of rubble, eroded by rain with peaks jutting out at improbable angles. Higher mountains are permanently covered in snow and many valleys are filled with glaciers. There are no trees on the islands and the most common vegetation is a brownish green moss, the colour of dead grass, that sprouts patchily up the mountainsides. However, many exotic Arctic flowers bloom here during the warm season. Svalbard literally means "cold edge", an apt name for this northern land. The climate is Arctic, tempered by warm North Atlantic Current. Summers are cool (July average 6.1°C, 43°F) and winters are cold (January average -15.8°C, 4°F), but wind chill means that it usually feels colder. The North Atlantic Current flows along west and north coasts of Spitsbergen, keeping water open and navigable most of the year. The high travel season is during Svalbard's brief summer, from June to August, when it's light and not too cold outside. However, the so-called "light winter" (March-May), when there is both sunlight and snow, is also increasingly popular for winter sports. Svalbard features the midnight sun from April 20 to August 23, although the sun itself is often hidden behind dense banks of fog. Conversely, the sun stays under the horizon during the polar night from October 26 to February 15. Dark Season Blues . Blues festival in end of October. An appropriately blues-themed way to mark the approach of winter. Svalbard has a unique visa policy - everybody may live and work in Svalbard indefinitely regardless of country of citizenship. Realistically though, getting in is expensive and time-consuming; it's nearly impossible to arrive in Svalbard without a stopover in Norway. Although Svalbard is a part of Norway, it has a separate border (mainland Norway is part of the Schengen area, whereas Svalbard is not). This means if you fly to Oslo from outside Schengen and connect to a nonstop flight to Svalbard, you do not need to pass through Norwegian immigration, and only need a visa if airside transit requires it for your nationality. However, if connecting to a flight with a stopover in Tromsø (as is likely on SAS flights), you will need to pass through immigration in Oslo (make sure to have arranged your papers for this in advance), board the flight from the domestic terminal and, during the stopover in Tromsø, pass through exit immigration. Therefore, if you need a Schengen visa, be extremely careful about whether your Oslo-Svalbard flight stops in Tromsø, as this determines whether you will need a Schengen visa. Otherwise you would have get an unnecessary visa. Longyearbyen has the largest airport on the islands (: LYR ). SAS (Scandinavian Airline Systems ) has scheduled flights from Oslo (IATA: OSL ) Su-F (4.5 hours, US$150-350 each way), and from Tromsø (IATA: TOS ) Su-Th (1.5 hours, US$100-300 each way). Budget airline Norwegian Air () has started flights between Oslo-Gardermoen (IATA:OSL) and Longyearbyen-Svalbard (IATA:LYR) on Mondays, Wednesday and Fridays. Flying time is approximately 3 hours. There are also occasional charters from Murmansk (IATA: MMK ) or Moscow. SAS considers flights to Longyearbyen from Oslo or Tromsø domestic, so a SAS EuroBonus award ticket from anywhere in Scandinavia to Svalbard costs just 10,000 EuroBonus points. This little loophole is well known by SAS frequent flyers and award availability is quite limited, so book well in advance if planning to use this. SAS flights can also be bought over the Internet either direct from SAS or via certain meta agents. The majority of flights are very expensive when booked on line but if you book well in advance you can usually find a few cheap flights a week. If you are flying to Longyearbyen from far away, a cheaper option may be to book a round the world flight (RTW). RTWs are specially-priced tickets which cover travel over several continents, several countries, or a certain (large) number of miles. Note that some flights arrive at odd hours (such as 3AM). Many outdoor activities on Svalbard demand that you are 100% fit, and you might not be if your flight arrive at 3AM and your activity starts at 7AM. 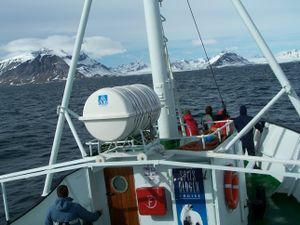 A number of operators offer cruises around Svalbard in the high season. These are the only practical means of visiting the more far-flung bits of the archipelago like Ny-Ålesund, but they don't come cheap: a typical 3-day cruise starting from Longyearbyen may cost you from 7900 kr (c. US$1500, cheapest cabin, twin sharing). There are also longer cruises, some starting all the way from Oslo, with rates going up to US$9500 for a 12-day trip. There are countless cruise operators, but they all seem to book on the same boats. Spitsbergen Travel  runs MS Fram and theMS Nordstjernen (1969), formerly a Swedish Navy ship, both refitted in 2000 for cruises. Other small ship favorites are the Antarctica Dream, Clipper Adventurer, MV Plancius, Ortelius, Akademik Vavilov, Ioffe, and the Polar Pioneer. Most of these vessels have been designed to plow the icy waters of the Arctic Ocean as well and comfortable facilities. While none of these can be described as "luxurious", other vessels such as the Le Boreal, Sea Spirit, and Le Diamant are larger and designed to cater to the luxury traveler. Some operators specialize in small ship cruise options and land safaris, such as Adventure Life and Haka Expeditions. If you want a full-fledged cruise ship, P&O  usually also drops in a few times a year on two-week trips. Actual passenger services to Svalbard are very limited. In the summer there is a cargo ship service from Tromsø once a week. The journey takes 2-3 days and prices are generally at least as steep as flights, but this cannot be considered as a usual measure of transport, as passengers are usually not allowed onboard. Very seldom, cargo ships also operate from Murmansk to Barentsburg, but this service has in recent years been reduced to one rotation per year. There is also the Polish sailing yacht Eltanin, which provides supplies for research stations. It sails once a year from Gdynia (usually May); however, the journey takes about 3 weeks . The only "highway" links the Longyearbyen airport to the Mine 7 via Longyearbyen. It is for the most part unsealed and anyway very short. There are paved streets in the settlement of Longyearbyen itself and many of the local residents tend to have cars. Snowmobiles are common transportation in wintertime. Travel between islands and settlements can be done by plane or helicopter any time of year. Boats can be used in summer. MS Polargirl runs a mail service several times a week between Longyearbyen, Barentsburg and Pyramiden and passengers are taken on these trips. Many people go with an expectation of seeing a polar bear on a boat safari. This is possible but by no means guaranteed. The official language is Norwegian. However, nearly everyone speaks English. In Barentsburg Russian and Ukrainian are spoken. Svalbard's visitors come mostly to experience Arctic nature at its rawest and most powerful. The islands feature untouched glaciers and craggy mountains, but also polar bears, caribou, a peculiar short legged reindeer, polar foxes, whales, seals and walruses. Svalbard is renowned for its variety of birds, including Arctic Terns, Arctic Fulmar and Puffins. Whales can be spotted off the coastlines particularly during late summer. Humpback whales, Orcas, Beluga Whales, and Narwhals all frequent the ocean waters near Svalbard. During the short summer, the melting snow in the milder parts of the islands give place to vast stretches of tundra vegetation, sometimes dotted with delicate flowers. Note that although it is technically possible to prepare your own excursion while on Svalbard, the lack of infrastructure, the necessity of carrying (and knowing how to use) a rifle outside the settlements, as well as the harshness of the environment even during the summer make pre-organized activities with professional guides a necessity for most visitors. Activities can be booked online or in Longyearbyen. Longyearbyen has a couple of museums and the world's northernmost church. The Soviet-era settlements of Barentsburg, still running fitfully, and Pyramiden, abandoned in the 1990s, make offbeat attractions, being home to (among other things) the world's two northernmost Lenin statues. Both can be visited by cruise or snowmobile from Longyearbyen. The currency is the Norwegian krone (NOK), and this is also accepted in the Russian settlements. Svalbard is a tax free zone so a number of shops in Longyearbyen display various items for sale at prices well below mainland Norway's. Svalbard is by most measures horribly expensive: mainland Norway is bad enough, but on Svalbard everything costs even more. Accommodation in cheap guesthouses costs on the order of 500 kr/night and sit-down meals nudge up closer to 100 kr each - both figures you can very easily double if you want to stay in a full-service hotel. Guided activities start at about 500kr per day (e.g. trekking and kayaking) but can go to 1000kr and above for tours requiring specialist equipment. One way to cut costs significantly is to self-cater, bringing all your supplies from the mainland. There is, however, a full service grocery store in Longyearbyen. Frozen and dry goods are on par with or even a little cheaper than in Norway, while perishable items arrive via air freight and are more expensive. Svalbard's duty-free status means that alcohol and sports clothing, etc. are actually much cheaper than on the mainland. Food on Svalbard is expensive for most visitors, as it is anywhere in Norway. Local specialities include seal and reindeer, served at restaurants in Longyearbyen. Alcohol is duty-free on Svalbard. If you´ve arrived from Norway the bars will seem refreshingly cheap but are still equivalent to London prices. If you head over to Barentsburg, Russian vodka can be outright cheap. A popular party trick for glacier cruises is drinks served with glacier ice, purified by natural processes over thousands of years. You can buy wine (<14%) in 'reasonable quantities'. A range of accommodation is available only on Longyearbyen, which offers camping, guesthouses and luxury hotels. Barentsburg and Ny-Ålesund also have a single hotel each. The University Centre in Svalbard (UNIS), . A private foundation run by four Norwegian universities, offers university-level courses in arctic biology, geology, geophysics and technology. Several hundred students, half of them exchange students from outside Norway, attend yearly. Citizens of Svalbard Treaty signatory countries need no permits to work on Svalbard; you can even set up your own mine if so inclined. In practice, work opportunities are rather more limited, although there is some seasonal tourist industry work available during the summer if you have the requisite skills and language abilities (Norwegian will come in handy). The Governor of Svalbard does, however, have the right to boot you off the island if you cannot support yourself. The biggest threat on Svalbard is polar bears (isbjørn), some 500 of which inhabit the main islands at any one time. Six people have been killed by polar bears since 1973, the most recent in August 2011, so if travelling outside settlements you are required to carry a rifle at all times to protect yourself. They can be rented for about 150 kr and up per day, but starting 2009, a valid gun license is now required; those without a gun license can apply for temporary permission to rent a rifle: all that is required is to fill out an application form ( ) and a certificate of good conduct (i.e. proof of no criminal record) which can be e-mailed to the Svalbard Police Department. Processing may take up to 4 weeks, but has been known to work even on the same day with some luck. However, for most people, it's better to stick to guided tours. Do not underestimate the speed of polar bears (you cannot outrun one). Polar bears can be extremely unpredictable and are far more dangerous than European brown bears. Note that you are in no way allowed to kill polar bears without it being an immediate threat to your life. Polar Bears do not generally look upon humans for food, but it is important to realize that they are naturally curious creatures and will carefully assess the environment around them. A really hungry bear will eat almost anything. As a general rule of thumb, the younger the bear, the more dangerous they will become because they are inexperienced, have limited hunting skills and may have a hard time catching prey. Most bears will run away when confronted by humans, or at least attempt to avoid an encounter, even if they are curious. Many situations can be assessed with some common sense and knowledge of bear behaviour. If there is time, your first step should be to determine what kind of polar bear(s) you are dealing with, and whether it is interested in you or not. Remember to play it safe, though. It is always best not to count on the bear avoiding you. If the bear moves directly toward you, make yourself visible early and also make noise. Shouting , clapping your hands or starting an engine will make the bear aware of you. This may be enough to cause the bear to withdraw. If the bear is still interested in you, you should be prepared to use a signal pistol with crack cartridges, or shoot a warning shot from a rifle to scare it away. Killing a polar bear should be the last thing that you resort to. If you are forced to kill or severely injure a polar bear, aim at the chest or the shoulder. DO NOT shoot a polar bear in the head. If it's a female polar bear charging at you and her cubs are tagging along, DO NOT kill any of her cubs or else the bear will become even more aggressive towards you. Once a polar bear is killed, YOU MUST contact the local authorities to arrive on the scene and immediately notify the Governor of Svalbard. Another lesser (but more likely to meet) wildlife danger is Arctic Terns. When they have eggs, they are very protective of their nests and they will scream and try to scare you off - but also might actually peck your head bloody. You are not allowed to hit them even when they are attacking. The one trick that works is to have a stick of some sort and wave it in circles above your head. The birds get confused and can't decide what point to attack, so you can get away safely. 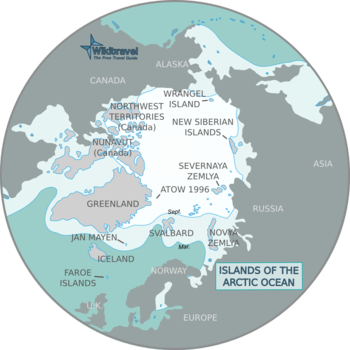 The harsh Arctic environment also poses its own challenges, particularly in winter. Beware of the danger of frostbite in the face (nose and cheeks), fingers and toes, particularly in low temperatures with wind (such as high speed on snowmobile). Crossing glaciers and rivers can be hazardous and travelling with local guides is strongly recommended. If heading out on your own, informing the Governor of Svalbard about your route and expected duration is highly advisable. For any trips outside central region of Spitsbergen, you must notify the Governor, and may be required to purchase insurance or put up a large deposit to cover possible rescue costs. Tap water on Svalbard is drinkable, but surface water may contain tapeworm eggs from fox feces and should be boiled before consumption. There is a pharmacy in Longyearbyen and you can buy some non-prescription drugs in the supermarket (Svalbardbutikken). Longyearbyen also has a hospital for treating emergencies. GSM/3G phones work in the main towns of Svalbard. 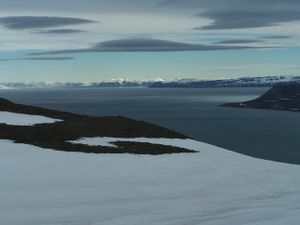 The Internet connection in Svalbard is top class, courtesy of NASA renting bulk capacity on undersea fibre optic cables running at seabed to mainland Norway for its experiments. Longyearbyen has several public Internet terminals. While mail from Svalbard to mainland Norway and the outside world uses regular Norwegian stamps at regular Norwegian prices, philatelists may be interested in the Lokalpost system used for intra-Svalbard mail. Stamps, first-day covers and more are available at the post offices in Longyearbyen and Barentsburg, as well as at Longyearbyen's Svalbardbutikken. Svalbard is a popular staging point (at least in relative terms) for launching expeditions to the North Pole. This page was last edited on 25 February 2019, at 08:57.